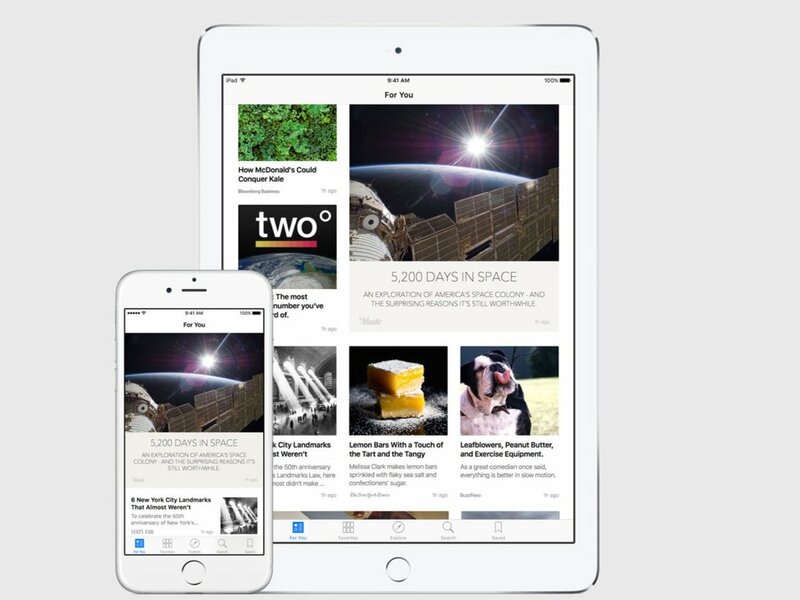 Apple's news aggregator app has been called many things in the five months since it launched, including Flipboard killer, but one thing you can't call it is well-made. My blog has been in Apple News for just under a week now, and in that time I have found numerous problems that frustrate me both as a publisher and as a news junkie. As a publisher I am disappointed by the lack of publisher tools. I have no access to stats, or any way to add my own. There's no way for me to fix a post, or even reset it, if Apple News is displaying it wrong. I also have no control over the topic tags, and no way to adjust the formatting. Yes, Apple has touted the fancy formatting tools they've built into the platform, but the reality is those tools are only available to a handful of publishers (Wired, for example). According to the Apple bot I blocked on Twitter, only 350 publishers have the tools, out of millions of websites. The vast majority of web publishers are in the same position as me, and can't do anything about the formatting in Apple News. Heck, I can't even affect the formatting by changing the feed at the other end. There's no best practices guide to tell me how to format the body of a post so it looks good in Apple News, and what little Apple does tell us includes false information (embedded video in RSS feeds is not supported, for example). As a result it's hit or miss whether articles in Apple News look good - assuming you can find the articles at all. As a news junkie, I have been paying close attention to how the feeds I follow look in Apple News, and I am frustrated by the flaws I have found. That looks bad (and neither the publisher nor the reader can do squat to fix it), but what's even more important than the articles that look bad are the ones which are misclassified. If you've used Apple News you may have noticed that you can follow all the posts on a topic, but what you might not have noticed is that the topic tags are applied at the whim of a drunken monk who lives in a wine barrel under Tim Cook's house. My recent story on Google's Editions at Play, for example, was tagged as Google Maps. My morning link posts were tagged variously as ebook, beverages, ebook readers, and digital publishing. And my recent posts on Amazon were tagged US Media and e-commerce (there was also a third article, but it never appeared in Apple News). I could go on, but I think you get my point. The topic tags don't make any sense whatsoever, but I would suppose that poorly organized topic tags are better than articles not showing up at all. 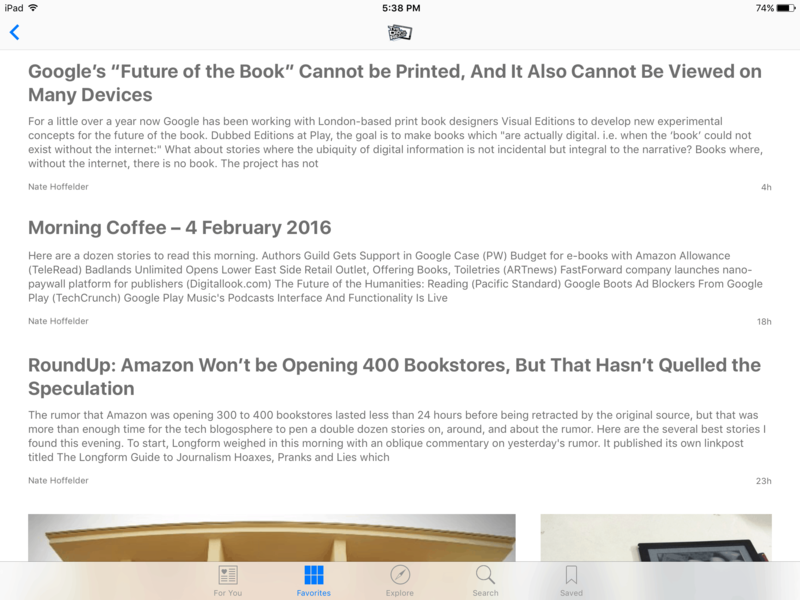 Over the past three days, Apple News has mislaid three posts from my RSS feed. None of the missing posts were earth-shattering news, but they still should have been delivered to the reader. And no, Apple News support has no idea why the articles went missing. Frankly this is not a good news reader app; it fails to deliver the news whether by publisher or topic. At this point Apple News makes Facebook look competent and impartial at delivering the news, and that's saying something. If you have an alternative, you should use it and wait for Apple to get their act together.